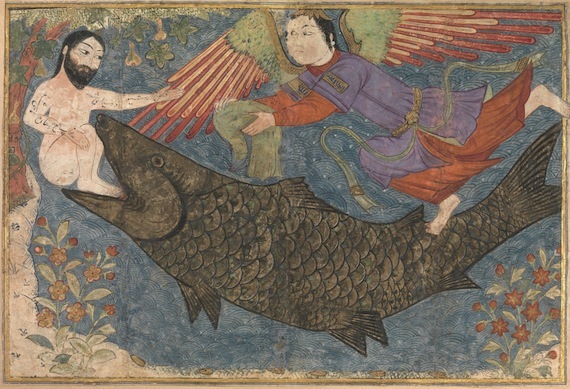 The story of Jonah and the Whale, mentioned in the Qur’an (37:139), was popular in the Muslim world and frequently illustrated in manuscripts of world history. This large-scale painting, however, never formed part of a manuscript. Rather, it may have been used during oral recitation or storytelling. Scholars have also suggested that with its strong palette, monumental figures, and spare composition, this work may reflect a now-lost wall painting tradition. Here, we see Jonah after his release from the belly of the fish. Above him, a gourd vine grows—sent by God to protect him from the elements—and, gliding across the top of the painting, a spirited angel with colorful spreading wings offers Jonah a garment.